Hello out there. Can you believe it's another Digital Dozen week already. I've gotta say that I think if it weren't for the Digital Dozen weeks each month to keep me motivated, then this blog just might fall to the wayside and die. Don't get me wrong, I still love painting my nails, and still do nail art on them at least once or twice a week, but seriously, who out there really cares whether I'm posting here or not? My first mani uses some polishes I bought with my Birthday gift voucher from Femme Fatale that my local nail buddies got me. I got the Dreamland lacquer set of neon scattered holos from the Autocorrect collection. I've not yet worn them each as single colours or even swatched them, but I have painted them onto my swatch sticks and I can say that they have a wonderful jelly appearance to show through lots of scattered holo. I remember going back years and years ago chatting with Noelie from Dreamland lacquer (Smitten back them) about where on earth to find these scattered holo particles. I'm so glad they are easy to come by now days, and to see these amazing colours from Noelie. I must point out that because I created a gradient with the shades, over a white base, that the colours look very pastel here. In reality, each colour on it's own is very vibrant. 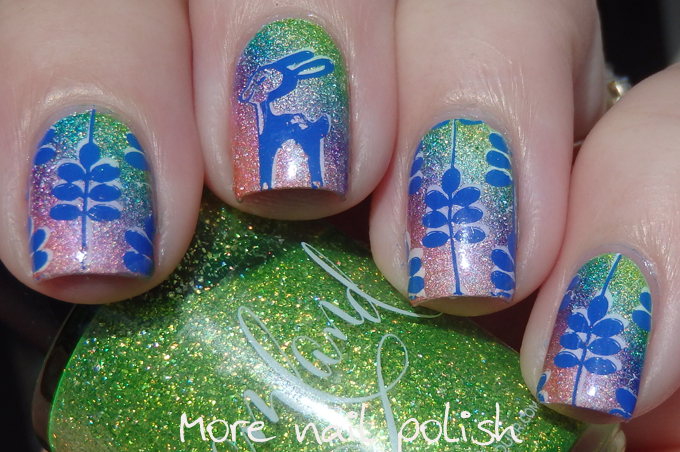 The little deer stamping was off BP35 and the leaves off something else.I took a leaf out of @Clairestelle8 book and added the double stamping. I always love how her stamping has so much depth because of it, but I'm not sure I quite achieved that. 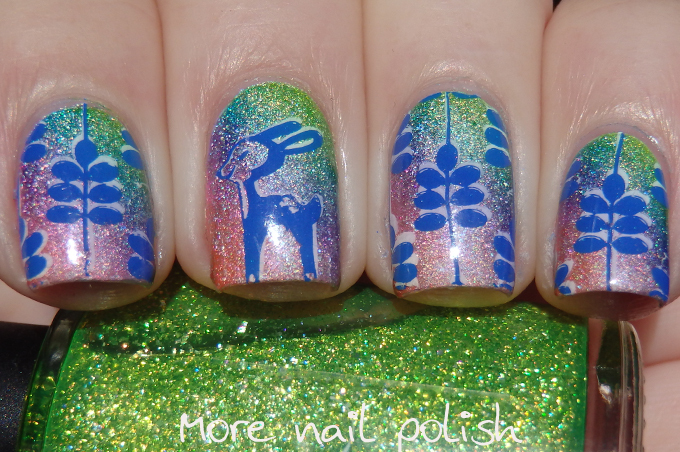 I love your blog - you are so creative and I like all the different manis you create! I care!!! Please don’t leave me (i love how consisent you are about blogging, especially since so many others have slowly dwindled and stopped posting)! Also, I adore your deisgns. 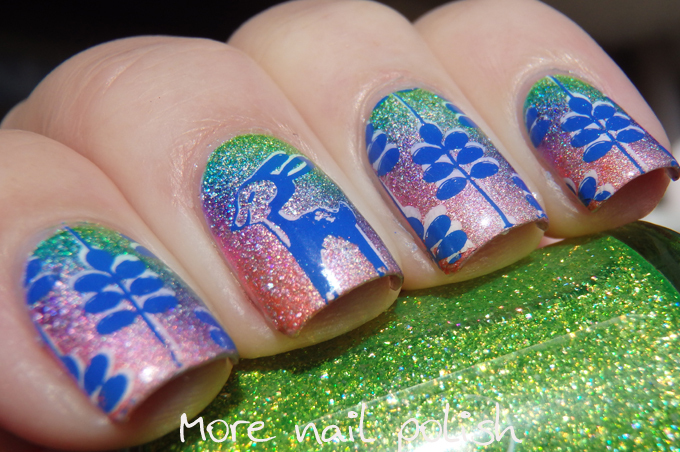 Nice Nail Art… Thanks for Sharing… Keep Updating Such More Post! 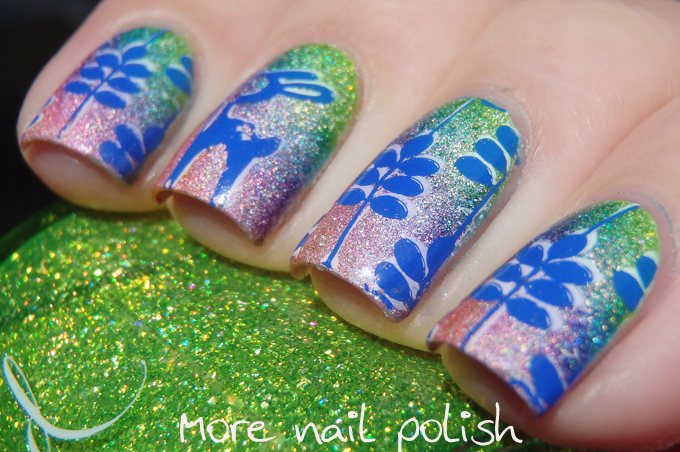 This is gorgeous--the colors you used, and yes, the double stamping did add depth! Love.